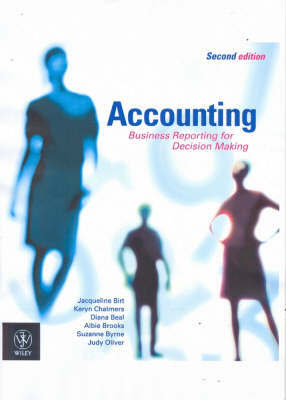 Accounting: Business Reporting for Decision Making Second Edition is written for students who are required to complete a one semester unit on introductory accounting, the text covers the basic principles of financial accounting, management, finance as well an introduction to ethics in business and corporate governance. The focus of new edition is on the application and interpretation of business reports and how the accounting information is used in business decision-making processes. The text emphasises the conceptual application of accounting and accounting information, providing clear explanations and applications so students appreciate the significant role of accounting information to all business environments. NEW TO THE SECOND EDITION * New chapter on performance management* Two new chapters on Budgeting and Cost-Volume-Profit* New content on corporate governance and ethics* Completely new design will engage students with subject FEATURES * Develops the user/decision making approach by including a number of illustrative examples, extracts from the financial media and applications throughout the chapters. * Update to date coverage of external influences, such as professional regulation, CLERP, and Corporations Act, and the impacts to business. * Early position of a chapter on ethics, governance and stakeholders reinforces to students, early in their learning, the importance and ramifications of sound decision-making. * Reality Check. A chapter vignette that links the content of the chapter and concepts discussed to real-world, business applications. * Learning Checkpoints. Positioned at the end of each main chapter section, Learning Checkpoints list the key issues and processes presented in the chapter to that point. An easy to identify self learning feature. * Illustrative examples. Positioned strategically throughout all chapters, they present examples, with worked solutions, that enhance student understanding of the concepts outlined in the chapters. * Self Test Activities. Positioned at the end of each chapter they present a number of worked exercises and solutions that will build student confidence and conceptual understanding of the processes outlined in the chapter before they move on to attempt the end of chapter exercises and problems. ABOUT THE AUTHORS Jacqueline Birt is a lecturer in Accounting at the Australian National University. She has degrees from the University of Melbourne and RMIT, and is currently a PhD candidate at the Australian National University. She has had vast experience in teaching Accounting to students at both Higher School Certificate level and tertiary level over the past 16 years. In 2003 she was a recipient of the Pearson Education Accounting/Finance Lecturer of the Year Award and she also received a teaching excellence award from the Faculty of Economics and Commerce at the Australian National University. Jacqueline\'s research interests lie in financial accounting (accounting standards) and accounting education. Keryn Chalmers, BCom, Grad Dipl, PhD joined Monash University in 2003, as an Associate Professor in the Department of Accounting and Finance. For fifteen years prior to this she was with the School of Accounting and Finance at Victoria University. Her teaching responsibilities at the undergraduate and post graduate levels have primarily been in financial accounting and financial analysis. Keryn is an active researcher in the financial accounting and financial reporting area, specifically in relation to accounting policy and disclosure choices of management. Albie Brooks, BCom, DipEd, PhD, FCPA is a senior lecturer in accounting at Victoria University where he has taught for fifteen years. His teaching is predominantly in the areas of management accounting and business research methods. His research interests include management accounting innovation issues, corporate governance issues and accounting education. With Judy Oliver he was recipient of the 2003 Vice-Chancellor\'s Award for Teaching Excellence in the Faculty of Business and Law. Judy Oliver, BBus, MBus, CA, is a senior lecturer in accounting at the University of Tasmania. She teaches management accounting at both the undergraduate and postgraduate level. With Albie Brooks she was the recipient of the 2003 Vice-Chancellor\'s Award for Teaching Excellence in the Faculty of Business and Law. Diana Beal retired an Associate Professor in Finance at the University of Southern Queensland. Diana\'s initial training was as an economist and she worked for the government, both federal and state, for eight years. She also has a commerce degree, and can therefore read between the lines of a balance sheet. She has always had an interest in both business and personal finance. With an interest in most financial markets, Diana has traded property, shares, collectibles, forex and options. In addition, she ran her own business for 15 years before joining USQ. While at USQ, Diana has taught courses in business finance, personal finance, applied microeconomics, macroeconomics, financial markets and financial institutions management. Suzanne Byrne BBus, MPhil, FCPA, worked in the accounting and finance field, both in practice and academia, for the past 15 years. Her current position is as a senior lecturer at the University of Southern Queensland. She works closely with professionals in practice and in 2002 was the Queensland State President of CPA Australia. Suzanne is the recipient of a number of awards including the Institute of Chartered Accountants Teaching Award and the CPA Australia Young CPA of the Year Award.